A Sneak Peek into our November Smugglers and Thieves box! A very happy Saturday to you all! Here at Book Box Club HQ we are in full planning mode working on future boxes. We have a big to do list, and lots of exciting things to work out, but it’s tonnes of fun when we have the chance to do it together – that’s why setting up a business with your bookish bestie is the dream! Now that all of your October boxes are safely in the post and on their way to their new homes, we are getting all excited our November SMUGGLERS & THIEVES theme. Did you know that this November, ALL of the items in the box will be COMPLETELY AND TOTALLY EXCLUSIVE to Book Box Club? so if you want to get your hands on any of this gorgeous loot, you’ll need to make sure you’re subscribed! Last week we announced that our Smugglers and Thieves boxes will include a beautiful fabric item inspired by our featured read and designed especially for Book Box Club members by awesome UK homeware studio, Sparrow and Wolf (for more information click here). How adorable are these illustrations? 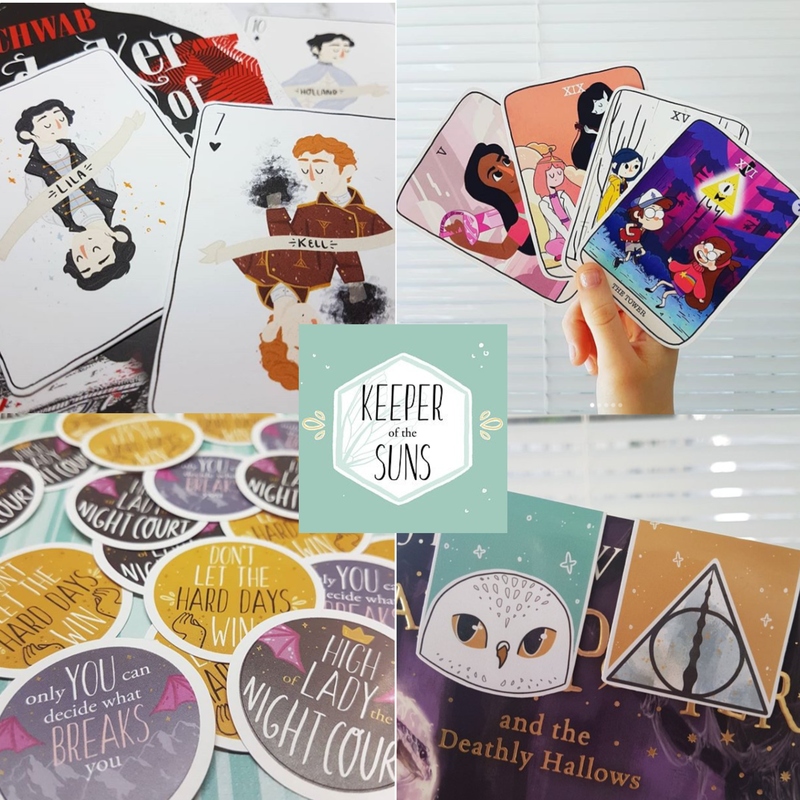 Keeper of the Suns is the brainchild of Australian based book-lover and artist, Jasmine – and we’ve been eyeing up her bookish artwork for ages. We have had such a great time collaborating on this piece, Jasmine was so excited when we mentioned what we had in mind, and her art has looks absolutely awesome on this perfectly practical item. If you’re yet to discover Keeper of the Suns, we urge you to go and check out her Etsy Shop, browse her bookmarks, pins, stickers and character depictions and give her gorgeous Instagram feed a follow. Our beautiful hardback featured read, complete with signed book plate from the author. Expect adventure at sea, friendship and great writing in this month’s book. We absolutely love stories that centre around sea voyages and we think that you guys are going to adore our nautical November read too. A piece of character art by the very talented Keeper of the Suns, printed on to a super useful exclusive item. An exclusive fabric item designed and made by amazing homeware designer Sparrow and Wolf. Lots of glorious goodies inspired by our favourite smugglers and thieves in fiction. Remember, ALL OF OUR ITEMS IN OUR NOVEMBER BOX ARE EXCLUSIVE TO BOOK BOX CLUB which means you’ll have to be signed up to get your hands on them. A personalised invitation to our members-only online book group meeting with the author of our featured read! Remember, if bookish goodies just aren’t your thing, check out our PURELY BOOKS subscriptions. With Purely Books you get the same great featured reads as we include in our Book Box Club boxes and an invitation to our online Clubhouse book group, just without the extra bookish goodies. Ok, time for us to put the kettle on for ANOTHER cup of tea and get back to planning/giggling/photo taking mayhem! Have a lovely rest of the weekend bookish buddies.